bin wine bar | Season It Already! Posted on October 9, 2013 by Carrie @ Season It Already! Today’s post is a guest post from my friend Jared, who lives in St. Paul, has also posted about Meritage and works over at Urban Olive & Vine. I’ve been to Bin Wine Bar a couple of times, but only because he introduced me. So it is only fitting that he writes this post! What can I say about Bin? It is an amazing little place on 6th and Selby in St Paul. On Thursday nights, in Mears Park, there is live music. You can sit outside at Bin and enjoy some music and an amazing wine and food in the summer. What do I like about Bin? Where to start…. The staff is very friendly. Brian is the manager and always a great guy. Todd is the bartender, also very friendly and ready to help. And the waiter that we usually get, Jacob, is fun and always fun to joke with. Todd, the chef and brother to the owner, is AMAZING. He has amazing ideas and a great palate. Rebecca, the owner, is always friendly and a social butterfly. She loves her patrons and her staff! They have an amazing wine list, great food, and they even offer beer and hard alcohol. The menu is a bit variable. They have small plates, street tacos, main dishes, and desserts. One of our favorites are the Canoas! AMAZING. 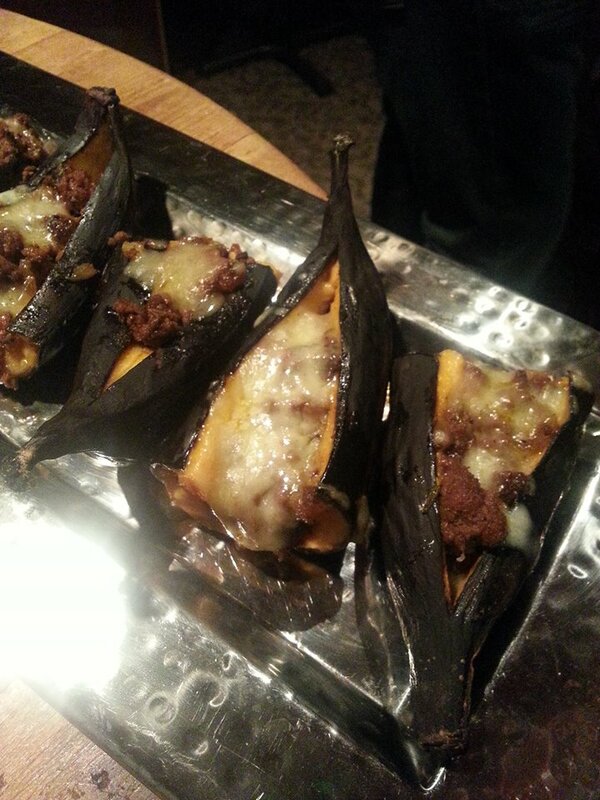 Baked plantains filled with cheese and spicy meat! The wines they have are really varied. They also have 3 different prices. You can go for a taste, a glass, or a bottle. The taste, if you pick 3, will come in a small tray with descriptions of the wines. We always have a great time at bin. The Eos is a perfect (dessert) wine accompaniment to the Mexican rum cake! MMMM CAKE!!! They were AMAZING to us a few weeks ago. My amazing husband Matt and I got married on September 7th and had our reception there. 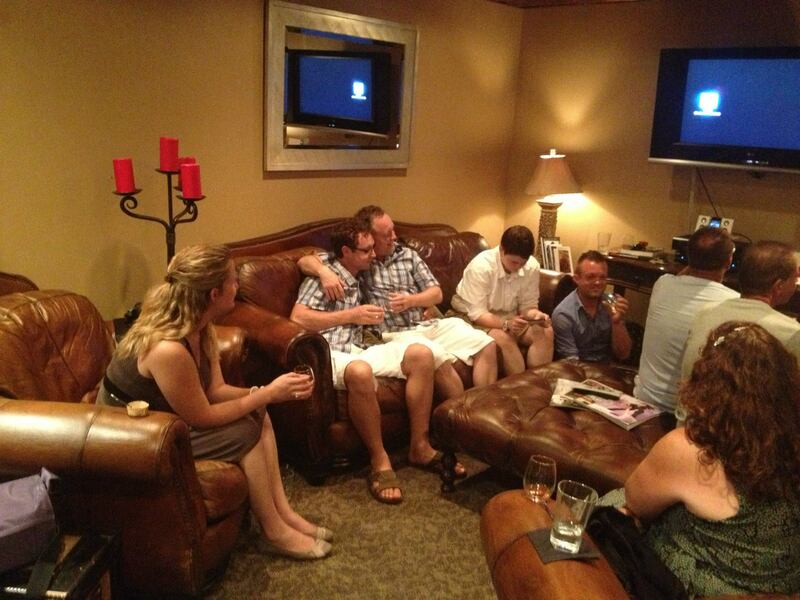 We used the wine cellar and had Champagne tasting with passed hors d’oeuvres for our reception. The staff was amazing and the food was outstanding! We had a wonderful group of friends that joined us. I also include the staff and manager in that category. Brian even made a little speech when he brought out the dessert for us. This is an amazing place to go for a special occasion or just for a night out! Congrats again to you and Matt! What is your favorite pairing with sparkling wine?